Because school starts so early for our kids, morning tends to be pretty rushed, meaning breakfast isn’t always the most elaborate (not that many of my meals are, to keep it real). One of our favorites that we work into our menu as often as is practical is not only a really budget-friendly recipe, but also super delicious. You can whip up these Simple Crepes for the whole family for breakfast, snack or even a dessert! This isn’t as much of an easy breakfast recipe as cereal, smoothies or even some of my oatmeal recipes I’ve shared – but once you whip up the batter really quick it’s just a matter of cooking and dishing up! These crepes are one of the dishes that EVERYONE in the family loves, and asks for seconds. And thirds – and sometimes my kids will even eat five or six of them! Yup, definitely a winner in my books. We mix up the toppings and drizzles sometimes, but the overall favorite so far has been strawberries, whipped cream and chocolate syrup drizzled on top. 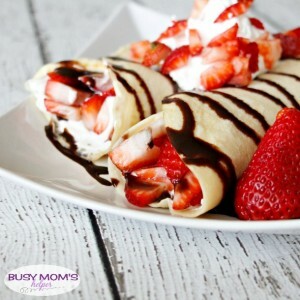 Makes me think of my Chocolate Crepes with Strawberry Cream! Note: We have 6 people in our family, who eat a LOT of these (like I said above, my kids sometimes eat 4-6 each) so we make a big batch. This recipe is what WE use to feed our family, and we often have about 6 large crepes leftover. If you have a smaller family, or they won’t eat as much, just divide the recipe as needed. Note: I use my blender to mix the batter, just breaking into thirds so it fits. You can use a mixer, too. Take a frying pan (we get 4 going at a time to be quicker, and it’s just different sizes), spray it with cooking spray, then heat up over medium-low heat. For large pans (like 10-14 inch) I do about 1/2-3/4 cup batter. More = thicker crepe, less = thinner crepe. When the edges are starting to come up and the crepe slides a bit when you shake the pan side to side, it’s time to flip it over. Don’t over cook! Spray your pan before each crepe, and continue through the batter. Serve warm with toppings of your choice! With 4 pans going, it doesn’t take long to flip through these simple crepes – it’s just a matter of staying alert to make sure they don’t burn! Adjust the heat as necessary as the pan gets hotter, or if there’s a thinner crepe.